Not unlike ObamaCare, a bill Congress had to pass “to find out what’s in it,” Illinois’ General Assembly passed a pension fix in December 2013 without an official scoring of the bill. During floor debates, House Leader Mike Madigan and proponents of Senate Bill 1 promised $160 billion in savings over 30 years. Many opponents of SB 1 feared, however, the savings from the deal would be lower than Madigan’s guarantee. The bill passed despite calls for postponing the vote until an official accounting of the bill was in hand. Now, newly released documents reveal what opponents suspected. The state’s upcoming $1 billion bond offering shows that the 30-year savings from the pension bill is only $145 billion. 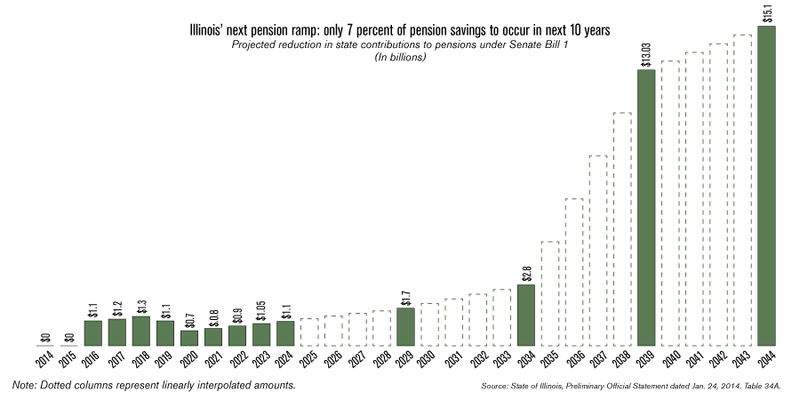 Even worse, the bond document exposes that just 7 percent of all savings from the pension deal will occur in the first 10 years. In other words, the promised savings are backloaded far into the future. Supporters of the bill are already backtracking on their promised $160 billion savings. They say the $15 billion shortfall in savings is due to better investment returns in 2013, which makes no sense when you consider that higher investment returns in one year have nothing to do with the expected savings from reforms such as higher retirement ages and lower cost-of-living adjustments. And much of the $145 billion in remaining savings can also be called into question. More than 20 percent of those “savings,” or $30 billion, are due to accounting gimmicks (investment income from a special account called the Pension Stabilization Fund is regarded as savings). There were many reasons to oppose this bill. The promised savings were never enough to solve the pension crisis. In fact, the bill did nothing more than deflate the pressure for real reform. Younger retirees and current workers are still at risk of seeing their pension benefits cut. Taxpayers are still being asked to bail out the pension system with ever-higher taxes. And core services are likely to be slashed to continue paying out overly generous government-sector benefits. Madigan promised this bill was just the first step of pension reform. Let’s hold him to that – because this bill was a step in the wrong direction.